The Elevate Mastering Bundle 1.5 includes Eventide's EQuivocate EQ and two new Plug-ins, Eventide Saturate and Eventide Punctuate. Elevate is the most advanced mastering plug-in ever created. This unique multi-band limiter, human-ear EQ and powerful audio maximizer will increase the loudness of your mix while maintaining or improving its dynamic perception. It uses intelligent, adaptive technology that responds in real time to your music; creating not only the loudest, but the best sounding master. Developed by Newfangled Audio, Elevate maintains subtle dynamics and improves the tonal balance of your mix. The adaptive limiter analyzes 26 frequency bands and alters the gain, speed and transients for each band in real time. The result is a transparent, natural sound, no matter how hard you push it. Elevate utilizes 26 critical filter bands modeled from the human ear. Each of the bands are spaced to give maximum control over how the sound hits your eardrum. Draw curves, solo bands and manipulate the transient attack for each individual band to bring out particular instruments such as kick or snare drums. Elevate uses artificial intelligence algorithms to make it easy for you to get the best sounds, but you can still get under the hood for as much precise control as you desire. This includes giving you control over the tonal balance and transients inside the final limiting stage. The adaptive algorithms reduce audible artifacts and the additional controls give you maximum flexibility with professional results. 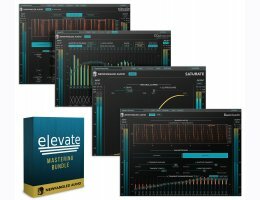 The Elevate Mastering bundle includes EQuivocate, a graphic EQ that uses filters which are modeled on the human ear. Perfect for mixing and mastering, EQuivocate's auditory filters and match EQ functionality make it incredibly powerful, simple to use, and natural sounding. Each of the 26 critical bands tickles a different part of your inner ear, making any combination of settings sound as natural as possible. Combining this with a linear-phase filter shape that reduces pre-echo makes EQuivocate an EQ with a difference you can hear. Saturate is a spectral clipper plug-in, useful for mixing or mastering. As such, it adds up to 24dB of drive with a variable CLIPPER SHAPE parameter that moves from a pleasant soft curve to full hard clipping. Unique spectral processing maintains the tonal balance of the distorted signal, no matter how hard it is pushed. Saturate automatically compensates output level based on the DRIVE control or, alternatively, allows this to be controlled manually. Punctuate is a transient emphasis plug-in also useful for mixing or mastering. It offers up to 26 auditory bands of TRANSIENT EMPHASIS or suppression while its unique ADAPTIVE TRANSIENT and ADAPTIVE LENGTH controls allow algorithms to tailor each band’s transient shaper to what the listener’s ear wants to hear. Customizable parameters for each band also allow users to tweak the result, if needed. Elevate adds true peak limiting, preventing final masters from clipping during reproduction and ensuring compatibility with all broadcast standards. New RANGE feature in EQuivocate allows users to scale or invert the total dB range for the EQ in order to change the total amount of EQ applied after setting the individual bands. This also allows users to scale the range of the MATCH EQ before and after it has been set. Additionally, each band benefits from enable buttons to easily turn bands on and off for better workflow with improvements implemented elsewhere also assisting. Analyzes and alters the gain, speed and transients of each filter band in real time. Includes presets by: APS Mastering, Matt Lange, Jeremy Lubsey, Eric Beam, ROCAsound, Chris Tabron and John McCaig. Automatically adapts the attack, release and look-ahead parameters for each filter band to greatly reduce "pumping" and breathing artifacts and perceived distortion. Preserves or emphasizes fast transients to avoid squashing your mix. Manipulates transients across the critical bands to preserve the attacks from kick drums, snares and cymbals, without affecting the entire mix. Uses linear phase auditory filters — based on the Mel Scale — to manipulate the audio in a way that is natural to your inner ear. Solo the output of one band (or a number of bands) to hone in on problem frequencies, tweak transients or alter gain. Use the Auto Output Level feature to compare the limited signal to non-limited signals with the same amount of gain allowing you to easily hear what impact the processing is having on your sound. Use the Spectral Clipper to overdrive the final output without affecting the tonal balance or allowing the signal to get “tubby.” Perfect for a more aggressive sound. Six different types of metering allow you to keep an eye on every aspect of your output audio. Learn more about equivocate here. Eventide uses PACE’s iLok.com licensing system, with or without an iLok hardware dongle, to authorize their plug-in products. Each license provides two activations which can reside on either your computer or on an iLok license dongle.